Oil on canvas, 20 ¼ x 26 ¼ in. Trained in Europe and at the National Academy of Design in New York, Sandona settled in San Francisco in 1901 where he earned his living as a portrait artist. (He also painted portraits in Hawaii --between 1903 and 1920 -- and in Santa Barbara.) His style changed with the times and varies from the bravura brushwork reminiscent of John Singer Sargent to Impressionism, Deco (in the 1930s), and bald realism (1950s). His most aesthetically appealing pieces, however, are his own version of Impressionism, which he produced at an unyet determined period (but most likely before 1920). Most of these are portraits but he also made a few figure studies as well as still lifes, such as Untitled. In these works edges are soft and undefined and objects are rendered with broken brushwork. 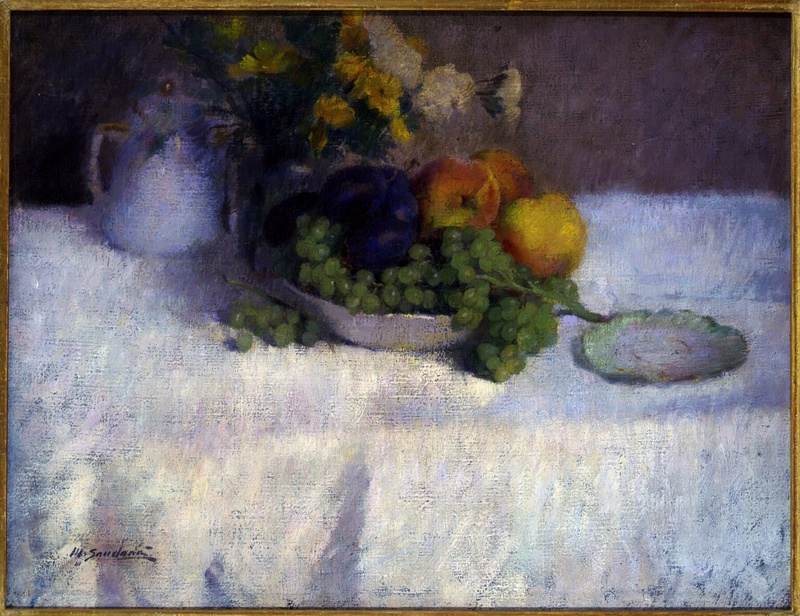 In this still life the focal point is high on the picture plane above an extensive foreground (a standard Impressionist format). The objects are arranged on a tabletop. This is a common still life composition type, some others being an arrangement of objects on a flat vertical space such as a letter rack or wall, or on a book shelf, or on a chair seat, etc.) and probably depicts California grown peaches, grapes and plums. Provenance: Ronald A. Belkin, Inc., Long Beach, February 2, 1985, who obtained it from Tim Mason who obtained it from descendants of the artist; exhibitions and publications: exhibited Bohemian Club, S.F. ; exhibited, 75 Works 75 Years Collecting the Art of California, Laguna Art Museum, Laguna Beach, Ca. April 2 – July 11, 1993, and reproduced in the catalogue in color p. 24; reproduced in color Nancy Moure, California Art: 450 Years of Painting & Other Media, Los Angeles: Dustin Publications, 1998, p. 170; Laguna Art Museum.